Discussion in 'Guitars For Sale / Trade / Wanted' started by g3rmanium, Jun 22, 2009.
i hob zwoa Siebensaiter, die i praktisch nie spui, deswegen verschenk i se. Die Erste is a Ibanez RG7420 (oder a RG1527 w/ a LOTRS, oder irgendwos Anderes, je nachdem, wem ma glaubt). 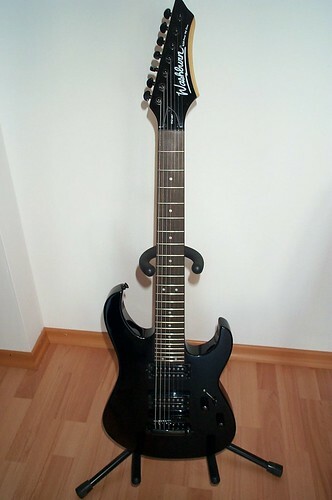 Die Zwoate is a Washburn WG587 von eBay. Net so der Knaller, find i. Modifications (if any): Washburn hod an sevenstring.org-Sticker unter der Brücke. Accessories (hardshell case etc): Goar nix. Location (City,State or City,Country): Minga. Fairerweise muß i dazusogn, daß i die Ibanez auf der D-Saitn net oktavrein kriag. Scheiße. Die Saitenlage von der Washburn hob i a bisserl reduziert, is net ganz meins, aber egal. Ansonsten: Kost nix, dafia darfst den Kram bei mia in Minga Obergiasing abholn (na, i verschick die Gitarren net). Kontakt: Mail, Twitter, ICQ, MSN. Or Nederlander. Whatever it is..
if only i was in germany!!!! can i just pay postage on the 7420 and you can still give the other away locally? Come over here and pick them up. If you can wait until Saturday, it sounds like a good plan. just out of interest, whats wrong with the guitars that you're giving them away for free???????? I haven't played on them much. There is a small issue with the Ibanez, too. I had planned to be in the mountains this weekend. Maybe the week after that? Don't forget I paid money for them, too. Week after that should be fine. Probably even better. What is the Ibby issue? Any issues with the Washburn? Can't intonate the D string properly (a bit too high at the 12th fret). The Washburn's fine. Cool, I can live with that... I'm off a bit at most frets..
After all the E? we've been through this is how you treat me?